"Coming from Canada, being a writer and Jewish as well, I have impeccable paranoia credentials." If you type the name Mordecai Richler into a search bar, you will get results as varied as the literature he penned and no small indication of controversy. What you will not find are Canadian schools and universities where his books are being studied other than maybe one or two courses offered occasionally at a teacher's discretion. Doesn’t it seem odd that an author who is the recipient of numerous awards including the Governor General’s Award, Companion of the Order of Canada, Screenwriters Guild of America Award, the Giller Prize, and an Honorary Doctorate of Letters from McGill University in Montreal, would have his work largely excluded from literary studies at Canadian universities? Oh, Canada! During Richler’s lifetime, he provoked people to think outside the box but this is a distinctly un-Canadian activity. Nobody knew quite what to do with his sometimes (okay, often) caustic observations of Canadian society so they did what comes naturally. They declared him racist and attempted to ban one of his books, Oh Canada! Oh Quebec. He was deliberately misquoted and duly penalized with death threats, anti-semitic Nazi-type reactions (from a journalist) and with political cartoons in the French press depicting him as Hitler. It didn’t seem to matter if the insults made any sense as long as some sort of negativity was hurled in his direction. Oh, Quebec! 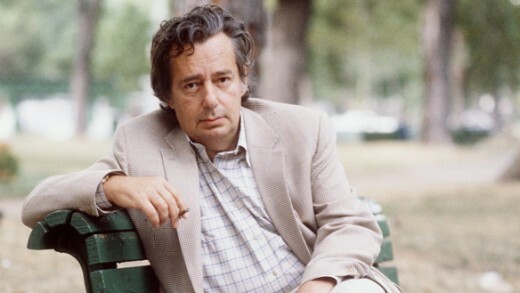 Richler was born January 27, 1931 and raised in a Jewish working class neighbourhood in Montreal, Canada. He left Montreal at the age of nineteen and lived in Europe for about twenty years, eighteen of them spent in London. When he left in the early '50s, he felt Canada was not a good place for an aspiring writer and in Richler's own words, was "a very narrow and parochial society...the standards weren't very high". He returned to Canada with his family in 1972. The reason for his return was quite simple. After writing several novels in England, he was beginning to run into problems constructing the characters’ ordinary experiences to work within the novel's precepts. He felt he was missing the more banal aspects of the cultural life that makes a novel ring true. In order to achieve a sense of authenticity, there were hours of research involved that a writer within that culture would have at his fingertips. In other words, it came down to what every English literature professor tells the students: write what you know. He published his first novel around the tender age of twenty-one and received a £100 (British pound) advance; not much of a salary on which to live. However, he began writing for The New Statesman and The Observer as well as several British periodicals and that kept the wolf from the door. He also did a little film work but it wasn't until his novels started being fully recognized that his life became more comfortable and that took a few years. He wasn't completely outside the Canadian experience during this time. In the last 10 years of his self-imposed exile, he returned to Canada about once a year on visits usually associated with magazine assignments. By this time, he was married and had five children. The family returned to Canada for a test year in 1968 while Richler worked as a writer in residence at Sir George Williams University in Montreal, a post he held until 1979. He made the move permanent four years later. Richler had been careful to ensure that his children were able to adjust to Canadian life. They did, although he stated that what was available in Montreal at the time did not compare with what the family had left behind in London, England. As for his feelings about the parochial nature of Canadian society he experienced in the early '50s, he found them very changed twenty or thirty years later. Asked this question in an interview with WCBS New York, December 5, 1983, Richler had this to say: "There's been a remarkable swing of the pendulum, almost too far in that we're now going through a period of cultural nationalism...now merely to be Canadian makes you a writer. So there are a lot of inflated reputations...a certain amount of nationalists' cultural nonsense being taught. On the other hand, there are some very talented people. I mean there's Robertson Davies, and there's Alice Munro and Margaret Atwood, Margaret Laurence.. the climate has changed and there are some very reputable publishers." Richler died in 2001 at the age of seventy. His last novel, Barney's Version , was published in 1997 and made into a movie in 2010. It subsequently won nine awards and an Oscar nomination. He also produced a large body of work in essays and anthologies. He was opinionated and clever, a combination not easily embraced by his contemporaries. So why aren't we studying Richler? So why isn’t Richler, one of Canada’s foremost authors, on the required reading list in Canadian schools? It comes down to a simple answer. Most of Canada doesn’t care if students read any Canadian literature at all. We are one of the few developed nations that don’t bother to read and study our own literature. Education is a provincial matter, not federal. British Columbia and Saskatchewan have legislation that ensures the study of Canadian work, both fiction and non-fiction. Quebec and Newfoundland are a little different. They have a culture unto their own and enjoy celebrating it. The rest of Canada is apathetic at best and at worst, still under the impression that Canadian work is inferior. This is what drove our authors out of the country 60 years ago. Isn’t it time we grow up? Budget cuts are another reason. It’s too expensive to supply copies of Canadian work to schools so we still rely on the old novels that have been taught since the ‘50s and before. They are not Canadian. Now we have entered the less expensive digital age. One of the recent changes as a direct result of this is the inclusion of blogs, newspaper ads and Facebook as part of the definition of literary text in the Ontario School curriculum. Personally, I find this horrifying. It’s like finding a spray painted Jen is a whore on the underside of a bridge and including it in the Art History curriculum. I’m embarrassed by the pathetic scrambling to be contemporary in schools. Just because it is written somewhere doesn’t make it worth studying. If we want to fully understand what it means to be Canadian, we need to stop asking self-proclaimed pundits whose only claim to fame is Canadian government television. Don't get me wrong. I'm glad one of our networks is government owned. It makes a nice counterpoint to others that are driven only by greed and as a result, does create an interesting balance. We need to stop being ‘liberal and inclusive” with whatever scribbling is on the Internet and start reading Canadian authors like Margaret Laurence, Carol Shields, Alice Munro, Margaret Atwood and Mordecai Richler. We will be surprised. Not only will we develop a sense of what it means to be Canadian, we just might continue on discovering more like Leonard Cohen (Beautiful Losers), Douglas Coupland (Generation X: Tales for an Accelerated Culture), Michael Ondaatje (The English Patient), and Robert James Sawyer (Flash Forward). This list of gifted authors is by no means complete. There are many more. In my opinion, we have lost our collective minds when it comes to eduction. Let's get back to learning the basics and growing new ideas from a good foundation. Save Facebook and blogs for a course in urban sociology. If we read Richler, we might actually learn a thing or two. Who knows? We may even produce more interesting graffiti! There are some writers who have had a profound influence on me. Among my favorites are Alice Munro, Carol Shields (if you haven't read Larry's Party, you are missing a gem) and Margaret Laurence. This is about Margaret Laurence.